The worldwide anti-McDonald's day protests in the Czech Republic saw some of the most imaginative and theatrical protests yet. "We want to consume more! Destroy the tropical rainforests! Throw ecologists in jail! Let's grind nature into hamburgers! Garbage is great!". 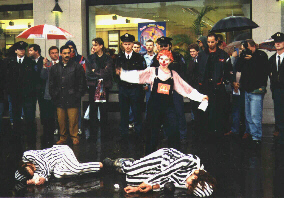 They captured the two ecologists outside the McDonald's branch, and carried out a trial, after which the clown Ronald McDonald executed them. A crowd of 'admirers' cheered and dashed towards the store with champagne to celebrate another victory for multinationals, but the store management did not let the costumed campaigners inside. A similar action occurred in Wenceslas Square in Prague. In all these protests involved hundreds of protestors and were seen and listened to by many hundred more people along the routes of the protests. Photo: Is this the end for Dave and Helen? McDonald's 40th Birthday - 150 people marched through the centre of Brno handing out leaflets after which there was a benefit gig when 5 bands played and videos were shown. McDonald's are so worried about their image in the Czech republic that in October 1994 they pulled a publicity stunt inviting journalists and activists including animal rights group Animal SOS to inspect stores and meat processing plants. A McLibel supporter in the Czech Republic writes "All people here, after the fall of socialism thought everything would be better, but I have to say that it is even worse. Rapid increase of racism, no one cares about the environment, our country is flooded with Western capitalism..."
There have been several actions against McDonald's in different Czech cities. 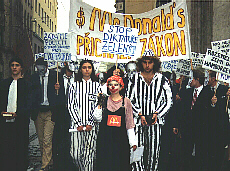 On 7 December 1993 in the Moravian city of Brno, a McDonald's assistant manager sprayed tear gas in a photographer's face during a protest at the opening of the county's seventh McDonald's. After initially denying that the offender was a McDonald's employee, the company issued a formal apology to the Czech Press Agency photographer. The incident occurred when about 30 people, mainly from the environmental group Duha were pushed and carried out of a McDonald's restaurant where they had been eating vegetables in a peaceful protest. "Just taking up the space is a form of violence" said McDonald's public relations manager Drahomira Jirakova. The McDonald's employee was asked to pay a small fine but is still working at McDonald's. At a demo in Prague 200 people turned out and over $15000 of damage was caused in battles with the police when bricks and paint were thrown.